Between June and October, Sculpture Milwaukee adds a cultural and economic layer to the fabric of downtown Milwaukee - dotting Wisconsin Avenue on both sides of the river, from the new Northwestern Mutual Tower to the Wisconsin Center District - with the finest sculptures from local, national and international artists. On any given day the exhibition as a whole and the individual pieces can be seen inspiring locals, drawing suburban residents downtown, strengthening Milwaukee’s tourism appeal and attracting the eyes of the global arts community. The breadth of a project like this cannot be captured in the physical description alone. For some, Sculpture Milwaukee is an economic development initiative. When Steve Marcus first envisioned it, the primary driver was to restore a sense of place and value to building owners, tenants and consumers along Wisconsin Avenue. For others, it is a community building experience. Over the last decade, cities across the U.S. - buttressed by academic research and the support of private foundations - have utilized public art as a powerful tool to engage and improve communities. As with all good art, Sculpture Milwaukee reaches different audiences in myriad ways. For every downtown worker whose day is brightened by a lunchtime stroll through the exhibition there is a tourist for whom this unique exhibit makes a visit to Milwaukee mandatory. For every student inspired by a particular sculpture there is a potential buyer somewhere across the globe who understands the unique marketplace that arises in downtown Milwaukee every summer. Add to that mix: suburban residents who rediscover Milwaukee through the lens of sculpture, the local artists for whom Sculpture Milwaukee opens doors, the office building owners whose buildings become more attractive, the businesses that attract millennial talent to a vibrant downtown, and the hotel and restaurant owners who benefit from the influx of visitors. All of these audiences are on our mind as we put together the final touches in preparation for the June launch of the 2019 exhibition. From the whimsical to the profound, from the vibrant and contemporary to the thought-provoking and abstract, the 2019 Sculpture Milwaukee exhibition will once again embody and inspire much of what makes Milwaukee unique. Whether you know your Tony Tasset from your Kiki Smith or you have no idea what that means, we invite you to experience Sculpture Milwaukee however you’d like. Sign up for a docent-led stroll throughout the exhibition. Use our app for a self-guided tour or just to engage with the sculpture closest to you. Participate in one of our many creative contests. Or simply spend time with one (or more) sculptures without any guidance and see where it takes you. However you engage with Sculpture Milwaukee, come do it on Wisconsin Avenue this summer. See you soon. 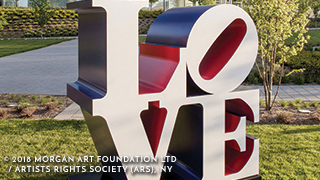 Summer 2019 promises to be a summer of LOVE, with Robert Indiana's iconic sculpture.